In a never-ending quest to better understand the Universe around us, astronomers are constantly in pursuit of new technologies and techniques that make their observations more accurate and their telescopes more sensitive. To acknowledge this pursuit, rather than an astrophysical object, this month's source of the month is a well-understood calibration light source... on an Unmanned Aerial Vehicle (UAV). Fig. 1: Principle of Airborne Calibration with a UAV. The H.E.S.S. telescope array consists of five telescopes. Similar to groups of people, it is good when everyone does great work by his own, but it is even better if they are able to combine their forces to achieve their goal together. For the H.E.S.S. telescopes to be able to work together, they need to be inter-calibrated. To do this, one would optimally have a well-understood calibration light source hanging above the array and shining light on all telescopes of the H.E.S.S. array. This would mean having a light source flying over the array in regular time intervals which was hardly possible at reasonable costs 15 years ago when H.E.S.S. started its operation. For this reason, muons from cosmic ray air showers were used to inter-calibrate the telescopes, as these produce a similar Cherenkov spectrum than electrons, are easily distinguishable from other events by their ring shape and have a well-known light yield. This works well enough for current arrays such as H.E.S.S., but for future arrays with higher precision and multiple telescopes sensitive to gamma rays produced at different energies, one needs to introduce wavelength dependency in the inter-calibration process. This is of course not possible with muons, as they produce one given spectrum. Recent advances in unmanned aerial vehicle technology have made UAVs an attractive possibility as an airborne calibration platform for astronomical facilities. This is especially true for arrays of telescopes spread over a large area, where a calibration light source can be held aloft above the array by the UAV, and simultaneously illuminate many telescopes. The feasibility of such a technique has been investigated for the planned Cherenkov Telescope Array (CTA) which showed that a UAV-based calibration system had a unique role to play in the calibration road-map for CTA . Since CTA is currently in the pre-production phase, a natural conclusion of this feasibility study was the need for proof-of-concept flights at the H.E.S.S. telescope array. For this reason, a flight campaign was undertaken at the H.E.S.S. telescope array in May 2018. For this campaign, an octocopter UAV, housing an ultraviolet calibration source capable of emitting pulsed light as short as ~4 nanoseconds, was flown at the H.E.S.S. site. Before deployment, the UAV's flight performance was characterised in detail at Durham University (e.g. ). As light source used for calibration, a system based on the CHEC calibration system was used. The calibration system flown on the UAV had its own GNSS system which we used to independently determine the position of the UAV, as well as trigger the flasher system using the GNSS timing signal. Taking off near the residence buildings of H.E.S.S., for each calibration flight, the UAV was flown to a predetermined position which the H.E.S.S. telescopes were observing. For the first time, the four smaller H.E.S.S. telescopes were observing a non-astronomical source in the sky. Very uncommon hexagonal images were recorded on the cameras due to the point source, which the UAV can be assumed to be, being defocused as the H.E.S.S. telescopes are focused to 10 km distance. As shown below, the images have a very different shape compared to cosmic events and can so be easily distinguished. Fig. 2: Example images recorded in the H.E.S.S. cameras: (left): Drone event; (centre): Cosmic ray event; (right): Muon ring. After having eliminated the cosmic events, the exact position of the UAV had to be determined, as the amount of light reaching a given position decreases quadratically with its distance to the UAV. This position determination can be done directly from the recorded images: if the light emitted by the UAV is centred in the camera, the UAV is in the pointing direction of this telescope; the further the light is away from the centre, the more the UAV is away from the pointing direction. So, knowing the pointing direction of a telescope and the position of the image of the UAV in its camera, we got the direction in which the UAV was supposed to be with respect to this telescope. Combining the data from the four H.E.S.S. I telescopes, we computed the most likely position of the UAV by triangulation as illustrated in the Fig. 1. Applying this position determination method to the UAV flight with the most events (about 23000 recorded UAV images per telescope), the position could be determined with a statistical uncertainty of less than 20 cm in altitude, less than 10 cm in the horizontal direction perpendicular to the pointing direction and less than 65 cm in the horizontal projection of the pointing direction. The position can be determined more precisely in the direction perpendicular to the pointing, as the pointing direction was very similar for the four telescopes (as all the four telescopes were pointing to the UAV to record its light), and so the reconstructed UAV directions per telescope are close-to-parallel, leading to the triangulation being less precise in this direction. On Fig. 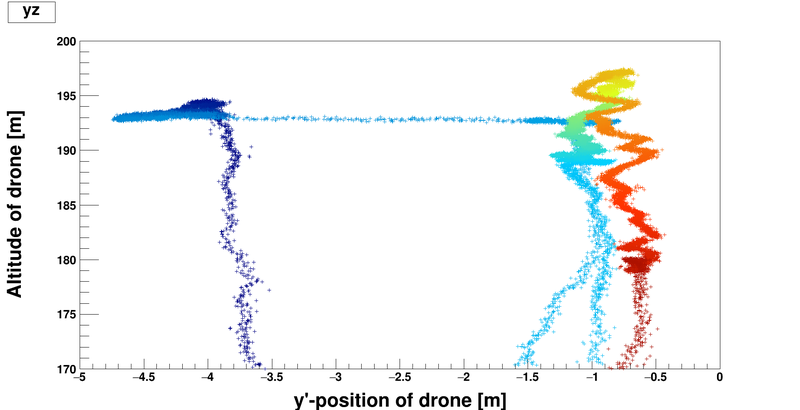 3, the altitude of the UAV is shown against its position in the horizontal direction perpendicular to the pointing direction, and the different colours of the data points indicate the time evolution. The small spread in between the different points shows that the statistical uncertainty on the determined position is very small, which enables us to even see small movements of the UAV during data taking. Fig. 3: Altitude of UAV against its position in horizontal direction perpendicular to pointing direction (both with respect to the centre of the H.E.S.S. array). Positions have been reconstructed from the images observed by the telescopes. The time evolution is indicated by the colour: Blue: Early times; Red: Late times. The vertical motion of the UAV is controlled flight rather than drift due to positional uncertainty. As mentioned before, the amount of light reaching the telescope is expected to decrease quadratically with its distance to the UAV, from geometrical considerations. To put it differently: I times d2 is constant, where I is the total measured light intensity in a given telescope and d is is the distance of this telescope to the UAV. However, a more careful look reveals that this is only approximately true: the further the light propagates through the atmosphere, the more light is lost due to atmospheric absorption leading to an additional reduction of the amount of light with distance. This effect is so small, however, that it can be neglected. Using this scaling, the relative efficiency of each telescope was defined as the value of I times d2 in this telescope divided by the average value of I times d2 in all telescopes. The inter-calibration value of the telescopes was then defined by the standard deviation of the deviation from the optimal value of one of these relative efficiencies. As the H.E.S.S. telescopes have previously been inter-calibrated with muons, the inter-calibration value is a measure for the consistency of both methods and so for the applicability of both methods, as they are based on a complete different principle with no common systematic uncertainties. In the table below, we list the preliminary results for the relative efficiencies of the four telescopes, their inter-calibration value as well as the statistical uncertainties of these values. Fig. 4: Example drone event as seen in all four telescopes. The found preliminary value for the inter-calibration of 4.5% shows that both muon and UAV inter-calibration lead to very consistent results, and that both methods probably have total uncertainties of approximately this value or less. The results of this first air-borne inter-calibration of a Cherenkov telescope array show that the method actually works and that it is worth further exploring its potential. This so more as using this method has further benefits. First, the method allows to check and ameliorate the pointing corrections, which account for the deformation under the effect of gravity of the telescope structure. Second, one could monitor the lowest layer of the atmosphere, either directly on the basis of the recorded light, or by mounting meteorological devices on the UAV. Last but not least, by using a different configuration, where the UAV is closer to the telescope, one could possibly also use it for camera flat-fielding.